Local search is an important concept to understand for any business that serves a local or regional audience. When a Google user’s query is local in nature, the search results take on a different structure. Localization can be explicitly or implicitly determined by Google. A search for “pizza rochester ny” is explicitly local, because the query contains the geographical qualifiers “rochester” and “ny.” But a search for “pizza” will also produce a localized search results page, since it’s highly likely that the user is looking for pizza near them. In the latter case, Google will determine the searcher’s location based on their network or mobile connection. Compared to traditional SEO, local SEO incorporates additional elements to consider. The most important of those is the “local pack,” which shows a map along with listings for the top-ranking results. 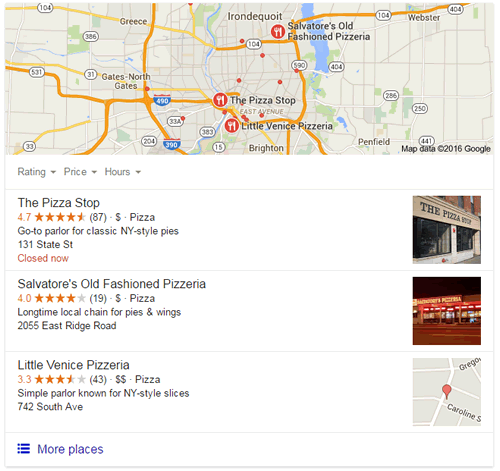 The local pack will appear above the organic search results, so those listings have greater visibility. For localized searches, the organic results that appear further down the page are also influenced by citations (pages outside of your Web site where your company’s name, address, and phone number appear), local links, etc. – elements that are not used as ranking signals for non-local searches. 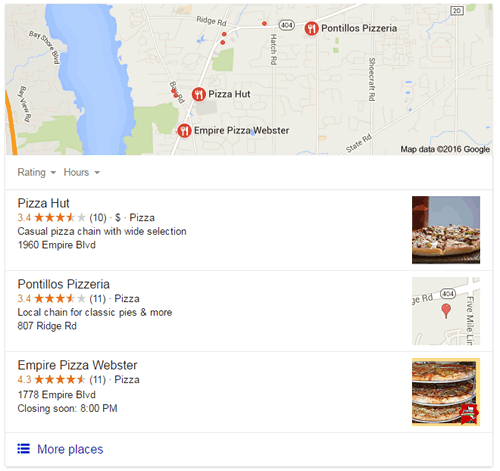 Figure 1 shows the map and 3-pack for the query “pizza.” Google localized it based on my network location (Webster, NY, a suburb of Rochester). Figure 2 shows the result for the query “pizza rochester ny.” Because my geo-qualifiers were explicit, the results are more centered around the city of Rochester, not my physical location. Figure 1: Local 3-pack that appeared in my “pizza” search results page. Figure 2: Local 3-pack for “pizza rochester ny” query. The 3-packs come from the Google My Business database. My Business is Google’s directory, or Yellow Pages, and the information comes from a number of sources. You are likely to discover that your business already has a listing, with the business name, address, and phone number – and possibly even some reviews – without your having to provide any data to Google. 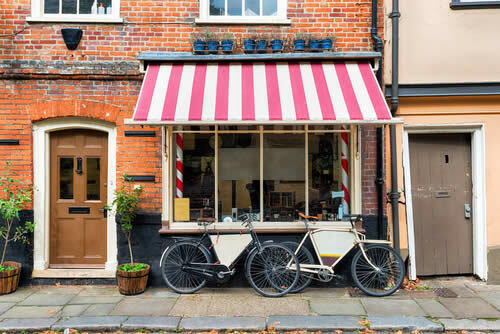 You should claim and verify your My Business listings (one for each physical location), and then you’ll be able to edit them. You want to pick one version and use that everywhere on the Web. Relevance of your listing to the user’s query. This is where the description and photos you provide as part of your listing are important. Distance from the user. Google has become hyper-local starting with their 2014 Pigeon update. Locations down to the neighborhood level are considered. Prominence of your business. Per Google: well-known brands that are familiar to many people are also likely to be prominent in local search results. Also based on information that Google has about a business from across the web (like links, articles, and directories, reviews). Your position in web results is also a factor, so SEO best practices also apply to local search optimization. One of the Google My Business features is the ability for users to review the business. Reviews are one of the signals that Google uses to ranking the local results, so it’s important to solicit your best customers for reviews, and monitor the reviews that come in. If negative reviews are submitted, respond quickly and helpfully. Other local listing services like Yelp are important, too. Be careful how you solicit reviews. If you were to do it on a large scale (e.g., email blast) you could end up with an unnatural jump in the number of reviews, which Google could interpret as questionable (e.g., you may be paying reviewers). Consider creating a page on your Web site (e.g., mycompany.com/reviews) with instructions for getting to your business listing and submitting the review. You can then promote the page on collateral, in store or office, on business cards, etc. Social media platforms like Facebook, Twitter, LinkedIn, Instagram, and Snapchat offer local search marketers the opportunity to build their local brand and expand their overall online footprint. When Google speaks of the “prominence of your business” (see above), social media can play a big role in being visible and well-known among local users. But for local SEO, also make sure that the keywords you’re integrating into the copy include the geographic qualifiers (neighborhood, town, city, state), again, making sure they’re consistent with the way they appear in your Business Listings. For your link building, concentrate on local-oriented links. A Rochester business listing site linking to your Rochester pizza restaurant is a geographically relevant signal. Mobile-friendliness is also an important factor, and Google provides a Mobile Friendly Test Page to help you evaluate your site. In addition to making sure that your site looks OK and functions correctly on mobile devices, mobile speed is a key factor, too. The Accelerated Mobile Pages (AMP) project gives developers extensions to standard HTML that enable faster loading of pages on mobile devices. Although Google has stated that AMP pages don’t necessarily get a rankings boost, page load speed is a known ranking factor in the Google algorithm. So every element of the mobile user experience – look & feel, functionality, content, and speed – needs to be addressed. Local SEO campaigns are like most marketing campaigns, it takes effort on a lot of fronts for them to be successful. Everything you can think of to make your brand more well-known within your target geography can contribute, either directly or indirectly, to better visibility in Google search results.